↑ Raṇajita Desāī; V. D. Katamble (2003). Shivaji the Great. Balwant Printers Pvt. Ltd., 193. ISBN 81-902000-0-3. ↑ 2.0 2.1 (2000) in Indu Ramchandani: Student’s Britannica: India (Set of 7 Vols.) 39. Popular Prakashan, 8. ISBN 978-0-85229-760-5. ↑ Sen, Siba Pada (1973). Historians and historiography in modern India. Institute of Historical Studies, 106. ISBN 9788120809000. Retrieved on 6 مارچ 2012. ↑ Jadunath Sarkar (1992). 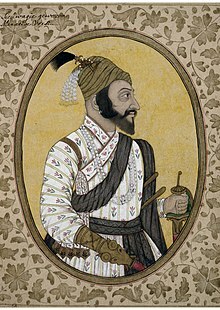 Shivaji and his times, 5, Orient Longman. ISBN 81-250-1347-4. ↑ N. Jayapalan (2001). History of India. Atlantic Publishers & Distri, 211. ISBN 978-81-7156-928-1. ↑ 6.0 6.1 Richard M. Eaton (17 نومبر 2005). A Social History of the Deccan, 1300–1761: Eight Indian Lives 1 (in British English). Location: Cambridge University Press, 128–221. ISBN 978-0-521-25484-7.